MCL Construction Ltd, Hawke’s Bay’s leading and most experienced construction and joinery firm. MCL started life as JC Mackersey Ltd in 1948, before becoming Mackersey Construction in 1988 and MCL in 2016. Many of Hawke’s Bay’s most prominent buildings have been built by our team of builders, site managers and project managers. We haven’t been confined to Hawke’s Bay and have been involved in health, education and government projects throughout the North Island. We are proud to be a major contributor to Hawke’s Bay, from employing over 100 staff, training the next generation of tradesmen through to supporting local charity organisations and sport clubs. To get a great idea of the projects we’ve been involved in go to the construction, joinery and interiors sections of this website. JC Mackersey Ltd was founded by John Charles Mackersey and commenced trading in 1948. 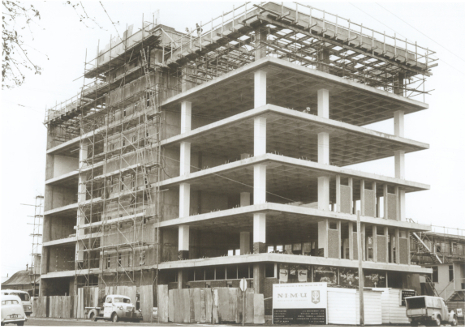 John was elected National President of the New Zealand Master Builders Federation in 1961. Since that date JC Mackersey Ltd continued to grow and expand leading to a full separation of property holdings from the construction operation in 1988. JC Mackersey Ltd became the Property & Development Company now called Mackersey Development Ltd. In 1989 John retired as Managing Director of JC Mackersey Ltd, with David Mackersey taking the reins, but remained actively involved in the building business until he passed away in 2002. He and his company transformed the skyline of Hawke's Bay during his building career. Now, 68 years after JC (John Charles) Mackersey Ltd was formed, the company has rebranded to MCL Construction Ltd.
MCL Managing Director John Bower says the new brand completes a new direction for the business, with John and David Mackersey being joined in 2015 by Project Manager/ Estimator Philip Mitchell and Financial Accountant Michael Bush as MCL Construction Ltd shareholders. Also under the MCL banner is MCL Interiors, specialising in suspended ceilings, office partitions and passive fire and MCL Joinery Ltd, a high end commercial and residential joinery business. MCL Joinery is headed by Ross Morgan, who has run the joinery division for 20 years while Jon Cruise is in charge of MCL Interiors.